Home » Dog food reviews » Top 10 Best Dog Food for Sensitive Stomach options rated and reviewed. Judging from their often ferocious appetites, most dogs have really strong stomachs which allow them to eat anything from cookies to shoes and carpets. However, even the strongest dog can fall prey to a sensitive stomach as a result of consuming an ingredient that doesn't agree with them, or just an infection that they happen to come across. Whatever the cause, dogs with sensitive tummi﻿es need to be fed with care, as consuming the wrong foods can aggravate their condition to cause undesirable and uncomfortable symptoms like vomiting, diarrhea or lack of energy, etc. If you suspect that your dog is suffering from a sensitivity or allergy, read on to find out what you can do about it and see some suggestions of natural and simple foods that you can feed them to help maintain good health and energy. The Hill’s brand is well known for applying an effective scientific approach to developing dog food based on the different needs of various breeds (like the Shollie and Saint Berdoodle) and age groups; their specially formulated recipe for sensitive stomach and skin is no exception. It’s made from high quality ingredients that have been selected for their nutritional properties such as Omega-6 fatty acids to promote a healthy coat, carefully chosen antioxidants for sensitive stomachs and vitamins C and E for improved immunity. Hill’s is a complete dog food that is nutritionally balanced and it’s been made with simple ingredients that are easy to digest, which makes it ideal for dogs that suffer from sensitive bowel issues. It’s available in different varieties to suit small dogs (like Shih Tzu Chihuahuas and Deer Head Chihuahuas) to large breeds like the Goberian and is either packaged as dry or canned depending on your dog’s needs and preferences. This dog food is great for dogs with allergies, as well and usually helps to clear them up within weeks of consuming it. Also, because of the real ingredients, this food tends to be very filling for dogs, so there’s no chance of them overindulging in it. Purina’s Pro Plan Focus dry food for adult dogs is made with simple and natural ingredients to satisfy sensitivity without causing any discomfort. As the primary ingredient, genuine salmon adds valuable nutriment to this food in the form of protein and beneficial Omega-6 fatty acids, while Oat Meal and rice provides the necessary fiber needed for dogs to easily process the food. This SmartBlend formula by Purina harnesses nature’s goodness to offer dog owners a more gentle option that is satisfying to eat and palatable in terms of taste. Not that we’d know, but based on feedback from many picky canine eaters, this crunchy food is love at first bite! A lot of dog owners prefer this food for their pooches with sensitive skin because of the nutritious, simple and familiar ingredients. Reading through the ingredients list gives you peace of mind knowing that you can recognize the ingredients which you’ll be putting into your furry friend’s mouth. From their minimalist, pastel colored packaging, one gets a sense of purity and an organic goodness vibe from these Nutro dog treats. But what really sets these chicken flavored biscuits apart from the rest is the combination of simple yet super healthy ingredients to make them. Not only are they fortified with whole natural grains, but they’re blended with natural fiber sources as well like pumpkin, chicory and natural coconut fibers to further strengthen your dog’s digestive function. However, this is a dry dog treat, so you’ll want there to be an abundant supply of water for your pet at all times as this will help them in assimilating the food to benefit from all its nutrients. You’ll be glad to know that these treats are 100% organic and don’t contain any preservatives, artificial colors or flavors, making it an ideal treat for dogs that suffer from allergies and sensitivities. In fact, they’re specially created to support your dog’s intestine health and immune function. With these treats, your dog will have access to real protein, antioxidants and vitamins without sacrificing taste or their health and if their rave reviews are anything to go by, these chewy biscuit bites should be a hit for your pups as well. If you’re looking for a treat that’s gentle on the tummy with very few ingredients yet flavorful enough to solicit repeated nibbles from your canine friend, then Wellness Limited Ingredient dog food is where it’s at. You can literally count the number of wholesome ingredients in this food with one hand and they’re all familiar foods derived from natural sources. Take the salmon and potato combination, for example; it’s simply made from salmon, ground dry potatoes, tomato pomace and flax seed oil, while nutrients like Vitamin A, B12, Folic acid, manganese sulphate and so on have been added to fortify the food in a bid to strengthen your dog’s digestive system. Due to their commitment to purity and integrity, this brand has excluded things like wheat gluten, eggs, animal by-products, preservatives, colorants and all artificial additives to ensure that the food doesn't upset sensitive tummies or give rise to any allergies. As the name implies, this food will definitely have you covered with the basics to keep your dog healthy, happy and satisfied. It’s simply made with a grain-free formula that supports healthy intestinal function and includes turkey protein, pumpkin and pea fiber. Furthermore, all their healthy carb requirements are covered with potatoes, oatmeal and brown rice. You can rest assured that your pet won’t be exposed to anything harmful to their system, as this food is free from any animal by-products, preservatives, colorants or additives. The only thing your pet will find is healthy and scrumptious blend of vegetables, fruits and micronutrients which have all been carefully selected for their ability to aid in the proper digestive function. It’s food that works great for dogs on a limited ingredient diet due to stomach sensitivities and is made with real ingredients only, so that it’s easy to digest and assimilate in their body for energy. It also contains a vivid flavor profile, thanks to the fact that it’s made from fresh ingredients that have their natural flavors preserved for a delightful taste sensation. What is the choice food for dogs with sensitive skin? With Natural Balance’s minimal ingredient recipe and compact packaging, they’ve provided dog owners with a balanced source of nutrition that’s made from natural ingredients derived from premium sources. This gentle food is suitable for dogs across the age spectrum - from puppies to seniors - and is free from harmful ingredients like artificial flavoring, colors and preservatives, ensuring your dog’s safety while providing for their nutrition and energy needs. 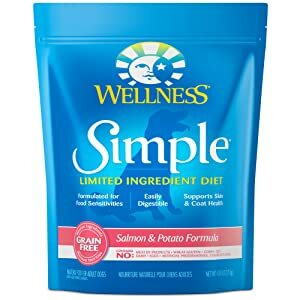 Depending on your dog’s needs, you can choose between the 2.75-ounce, 6-ounce and 13-ounce packs for single servings packed with premium grade, grain-free wholesomeness. They offer enticing flavor combinations like chicken and sweet potato, taking into consideration the nutritional profile of each ingredient and ensuring that each combination supports their promise of providing a gentle form of energy that’s supportive of good digestive health and immune function. To further ensure compliance with their high standards of providing pure and balanced nutrition, Natural Balance places every batch of food through nine different testing stages, to ensure premium quality. This gives you peace of mind every time you purchase one of their treats or dog food packs, knowing that it will help strengthen your dog’s sensitive tummy and avoid any tummy aches or niggles. Expressly made for easy digesting, Nature’s Recipe wet dog food combines high quality natural ingredients like deboned lamb cuts with easily digestible barley and rice fibers. Carrots and peas are thrown in for their rich antioxidant properties which help to strengthen your dog’s digestive function, while the naturally flavored gravy brings it all together for lip-smacking texture. Your dog’s stomach will also be happy to realize that there are no harmful ingredients like corn, wheat or meat by-products that might trigger their sensitivities and the amount of carbohydrates and protein makes for a truly filling and satisfying meal. The recipe has also been fortified with essential vitamins like vitamins A, B6, B12, D3, E, folic acid, zinc and even some Rosemary extract added to further fortify this super healthy dog food. Should your dog get tired of the stew’s consistency or flavor, Nature’s Recipe also offers other flavors like healthy vegetarian, chicken and rice and barley so you can switch it up regardless of your dog’s age or preferences. Made to optimize digestive health and satisfy fussy eaters with sensitive stomachs, Royal Canin’s ‘mini specials’ feature highly digestible proteins and are available in different varieties to cater for dogs in different age groups. Their special formula makes for enhanced palatability to help deliver healthy nutrients to picky puppies, while ensuring efficient assimilation of those nutrients for immune health and wellness. The simple ingredients include things like chicken meal, brewer’s rice, dried beet pulp and brewer’s dried yeast, to name but a few. Additionally, you can expect to find nutrients like Omega 3 and 6, high quality protein, B-vitamins and D-calcium among others, while the balanced formula ensures a good intake of beneficial calories in good measure. Most dogs really enjoy the flavor and texture of this food, regardless of their preferences and apart from being suitable for dogs with sensitive tummies, this food even works for dogs with bad or missing teeth! These palatable grain free kibbles from Instinct are a safe source of protein for dogs with special diet needs as they contain natural protein which has been dry frozen to preserve its nutritional integrity while preventing it from prematurely going off. From the ingredients list, you can expect to find lamb meal, turkey meal, carrots, pumpkin seeds, cranberries and dried tomato pomace with absolutely no preservatives, artificial colors or flavorings. These also come with added vitamins like A, D3, B12, E, Omegas 3 and 6, as well as iron, manganese and zinc. In addition, this food is free from gluten, soy, corn and harmful grains that might upset sensitive tummies, while providing balanced nutrition for all types of breeds and dog sizes. The small peanut-sized kibbles have been made to mimic what your dog would eat in the wild, which is probably why most pups find them easy to consume and digest. What is the best dog food for puppies with sensitive stomachs? Made especially for small and toy breeds, Solid Gold’s carefully formulated recipe comprises a combination of grain-free and organic proteins like chicken, turkey and bison, with light carbohydrates such as brown rice, chickpea and pumpkin. To bump up its nutritional content, the nibbles are fortified with a number of nutrient dense superfoods to give your dog the best in holistic nutrition. Carrots, blueberries, almond oil, kelp, broccoli and others all work together to provide your dog with healthy and easily digestible fiber that keeps them energetic and on the move. The nutritional value of this wholesome dog fare is further enhanced by the absence of nasties like corn, wheat, soy and artificial preservatives - all of which are complete no-no’s for picky eaters. The vibrant packaging only adds to the allure of this product, with clear labelling that’s easy to understand and feeding instructions that are easy to follow. Some dogs exhibit an intolerance to carbohydrates over time, which is characterized by the occurrence of gastrointestinal illness; while lactose intolerant pups will show symptoms like diarrhea, flatulence or bloating. You can easily spot when your dog has an intolerance to a specific ingredient or food type by the reaction that their system has after ingesting it. However, a visit to the vet is always a good idea to confirm the intolerance. In other cases, a dog will just be allergic to a particular protein source due to being exposed to that particular food source or ingredients for prolonged periods of time. Which is why it’s so important to diversify your dog’s diet appropriately so that they benefit from different nutrients, which in turn, improves their immunity. Another probable cause of food allergies is the presence of certain food additives that can wreak havoc on your dog’s digestive system. Sometimes, a dog will exhibit an allergy or sensitive stomach as a symptom of underlying issues like pancreatic deterioration, parasite infections or toxicity from spoiled foods, etc. As a result, the sensitivity will only be present for a short period of time and can easily be treated through pharmacologic therapy. However, if your dog continues to display symptoms in the long term, then a sensitivity may be indicated by the vet which is then usually followed by a recommendation to put them on a limited ingredient diet. If your dog starts having loose stools, it might be a sign of sensitivity and this often happens when you’ve maybe added something new to their diet, or they’ve experimented with a food that they weren’t supposed to. Soft stools can be unpleasant to experience and when they start to happen frequently with your dog, you should take them to the vet for examination. Is your dog missing mealtimes or no longer showing an interest in their favorite foods? This might be a sign of intolerance or sensitivity to a particular ingredient. Hyposalivation is no joke and can happen as a result of an allergy or sensitivity to certain foods. Your dog should feel energized and start running around after a meal to show that they’re satisfied, so if they’re doing the opposite, then clearly that’s a sign of an underlying problem. That problem could be an intolerance to a particular ingredient or food group. Is your puppy letting one rip a little too frequently? Their stomach is probably not agreeing with something they ate and it might happen again so pay attention. Dogs will sometimes eat grass to try and heal themselves when feeling queasy or even bloated, so be sure to have them checked for food sensitivity if they start doing this more frequently than usual. Vomiting is another tell-tale sign of experiencing allergies and food sensitivity and you can easily ascertain the cause by visiting the vet or trying out a different food with more organic ingredients and less artificial additives. You’d be surprised to find that a sensitive stomach in dogs is caused by different reasons. While some are born with the insensitivity, others pick it up along the way due to having their immune system compromised by an illness or disease. Whatever the cause, stomach sensitivity is easy to spot with the symptoms mentioned above, so it’s helpful to stay vigilant so that you’re able to easily spot it and take action when your dog is frequently showing any or all of these symptoms. Having a sensitivity to a certain food can take the fun out of eating their favorite foods, but your dog can fully recover from their condition with the right diet. Additionally, there are plenty of flavorful options for you to choose from so that they’re able to get good nutrition without sacrificing their favorite flavors. As you can see, there are various causes for sensitivity, so you don't have to beat yourself up about it. Just take the correct measures when it does occur so that your pet is able to receive the best care in maintaining good health moving forward. We hope that your quest for the best dog food for sensitive stomach comes to an end and you find something suitable from our list. Has your dog experienced any of the symptoms mentioned? If so, how were you able to deal with it? Please feel free to share your experiences and ask any questions you might have in the comments section below, we’d love to hear from you!